Propensity to offend is an important and stable predictor of offending. A person’s propensity is often thought of as a multidimensional trait consisting of morality and low self-control. The aim of this paper is to explain individual differences in propensity to offend as one single construct and two of its dimensions, namely morality and low self-control. It is well established that low levels of morality and low self-control increase the risk of offending. However, there is less empirical research that focuses on the main predictors of morality and self-control. Therefore the main research question for this study is to explain to what extent parental attachment, parental control and the school social bond have a direct effect on one’s propensity to offend (low morality or delinquency tolerance and low self-control). The data are drawn from two different samples of young adolescents in Antwerp, Belgium (N = 2,486), and Halmstad, Sweden (N = 1,003). The results show that parental control, parental attachment and the school social bond have direct effects on individual differences in propensity to offend, regardless of individual background variables. The results are highly equivalent in both samples. The similarity of the results across two independent samples suggests that the findings are stable. Implications for further studies are discussed. Svensson, R., & Pauwels, L. (2008). Is a risky lifestyle always “risky”? 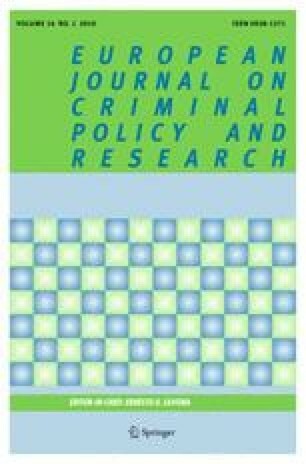 The interaction between individual propensity and lifestyle risk in adolescent offending: a test in two urban samples. Crime and Delinquency. OnlineFirst, published on September 24, 2008, doi: 10.1177/0011128708324290.